Readers must ask themselves whether they are entitled to a full understanding —or indeed if such a thing is ever possible. The past two Mondays here at the Asymptote Blog, we’ve brought you highlights from the July 2016 issue, THE DIVE. This week we’re back with Ellen Jones, editor of the vibrant and provocative multilingual writing section. 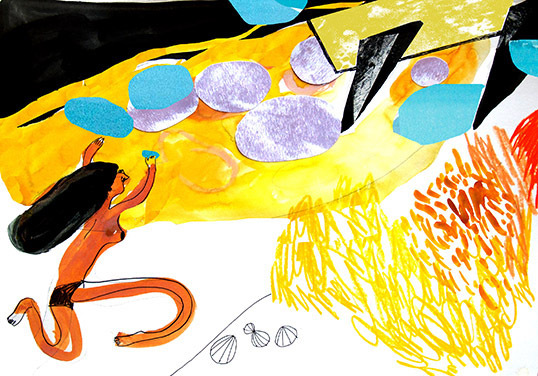 The Asymptote July issue special feature on multilingual writing is the second of its kind. The more than two hundred pieces of original poetry and fiction received in response to last year’s call for submissions—many, many more than we were able to publish—opened our eyes to the wealth of new writers who are experimenting with language mixing, and persuaded us that it was necessary to run the feature again. What I love most about this work is its variety. There are seven contributions, from writers as far afield as Peru, South Africa, and India that, between them, incorporate English, German, Spanish, French, Romanian, Sanskrit, Afrikaans, Italian, Nahuatl, and Arabic. But more importantly, they also make use of the spaces in between these languages: unique cross-lingual sound combinations and associations, and spoken varieties that are thriving but have yet to be documented. There is some poetry, some prose. Some written by well-established literary figures and some by poets who are only just finding their voices. Some pieces for readers of only English, others best left to the true polyglots among us. Highlights from the July 2016 Issue and the Contest Continues! 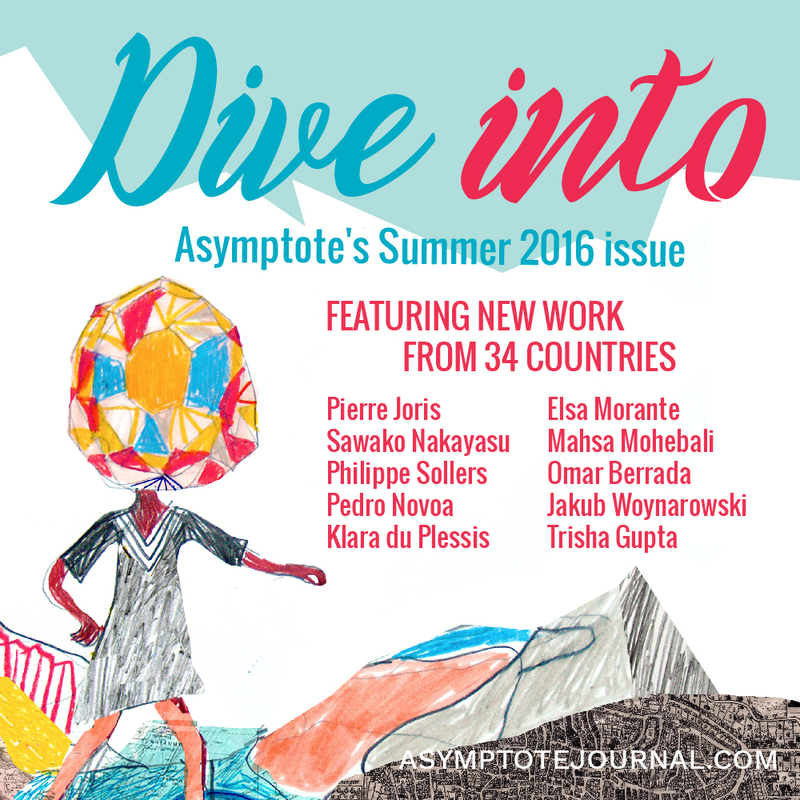 Our blog editors recommend their favorite pieces from Asymptote’s Summer 2016 issue. 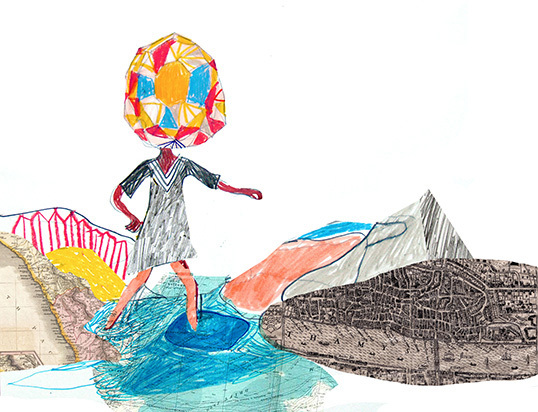 Send us your favorite piece in the new issue and the reason you love it in 400 words or less. Submit here today for another chance to win one of those precious free books! The deadline for each contest is tomorrow, the 19th of July. And, secondly, we hope you are as excited as we are about the release of our summer issue, THE DIVE. The issue is packed full of captivating stories, poems, drama, visual art, criticism and interviews from 34 different countries. There are translations from five languages never-before presented in Asymptote (Estonian, French Creole, Kiezdeutsch, Old English, and Xitsonga) as well as our second-ever Multilingual Writing section. Here at the Asymptote Blog, we’ve picked our highlights, listed below, in no particular order. Television: The Thousand and One Nights by Robert Merino, translated from Spanish by Neil Davidson. Recommended by Allegra Rosenbaum, Blog Editor. Robert Merino describes the arrival of a television in his childhood home in Chile. The writing is very much a stream of life events, surrounded by this electronic piece of furniture. We watch Merino grow up and come of age throughout the essay with television. It is the center of his universe, his upbringing, his babysitter, and his cultural education.